Quebec City public health officials say they've found the likely source of the outbreak of legionnaires' disease that has killed 13 people and made nearly 170 others ill since July. The five-storey building, in the provincial capital's St. Roch neighbourhood, is known as Complexe Jacques Cartier and houses offices for the Centrale des syndicats du Québec, the province's third-largest labour federation. 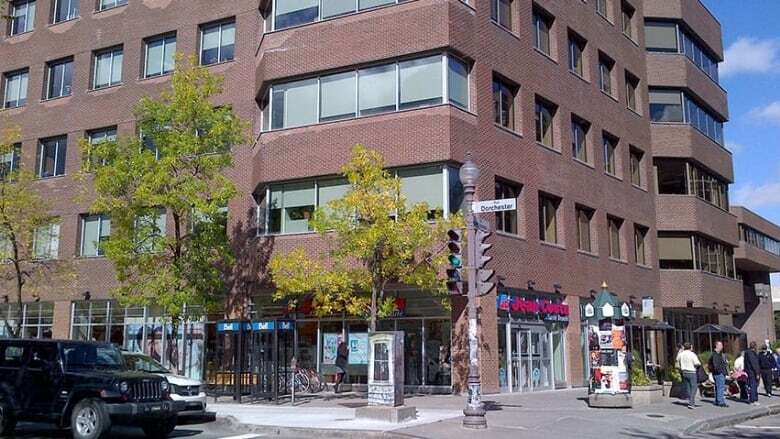 The building is adjacent to the Gabrielle Roy branch of the municipal library and also has a dental clinic, Dunkin' Donuts outlet and Desjardins bank branch. The city and the CSQ co-own the building, but the city said Wednesday that the CSQ is in charge of the heating and cooling systems. Quebec City regional public health director François Desbiens said the building's rooftop cooling tower — a heat-removal device that's part of the ventilation of many commercial and industrial buildings — has been treated twice and the owners have fully co-operated with authorities. Desbiens said city and CSQ were surprised to learn their building was the source of the legionnaires' disease outbreak. They've shut down the cooling tower and will not restart it until an engineer certifies it meets requirements drawn up by Quebec's building-code authority and other experts. Complexe Jacques Cartier's cooling tower was tested twice for the legionella bacteria that cause the disease, on Aug. 21 and Aug. 28. But it can take weeks for the samples taken from the unit to culture enough microbes for them to be genetically tested. When they were, authorities found a match with the pathogens found in people infected during the outbreak. The outbreak has been considered under control since Sept. 7. While new cases were still diagnosed after that date, none of them started to show symptoms after the end of August. Legionnaires' disease manifests as a flu-like pneumonia that usually only sickens people with lung problems or weak immune systems. The legionella bacteria thrive in warm temperatures and can breed in the stagnant water of cooling towers before spreading in the mist released by them. The most fatal Canadian legionnaires' outbreak in the last 20 years was in Toronto, where a 2005 outbreak at a nursing home caused 21 deaths and made 127 people sick. This summer's Quebec outbreak was all the more tragic because a report 15 years ago suggested ways to prevent it but was ignored, Quebec City Mayor Régis Labeaume has said.